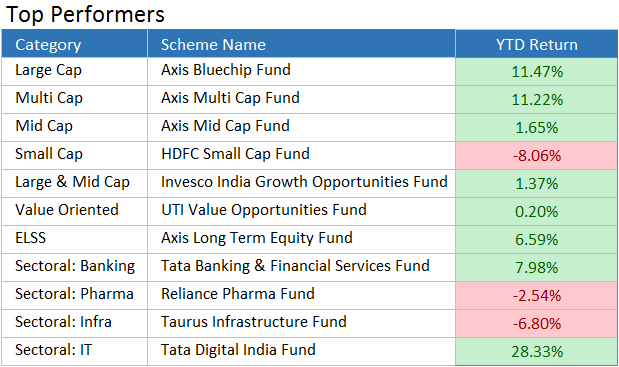 Read to know what all changed in the mutual fund world in the past one week. After rallying in the past two weeks, this week, the market witnessed a correction phase. Amid earning optimism, no-confidence motion against Modi’s government led the market down. In future, it is unlikely to see an immediate revival due to ongoing trade war between the US and China. 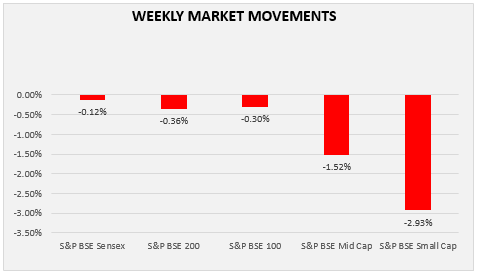 During current week’s market correction, S&P BSE Midcap and S&P BSE Smallcap fell 1.52% and 2.93%. Let’s find out what were the major changes that occurred throughout the past one week. The equity market was traded in loss. Sensex closed down at the weekly loss of 0.12% and S&P BSE 200 & S&P BSE 100 fell by 0.36% and 0.30%, respectively. However, S&P BSE midcap and S&P BSE Small cap suffered loss of 1.52% and 2.93%, resp. On Monday, after the news release that Indian Wholesale Price Index (WPI) rose to its 4-year highest, i.e., 5.77% in June 2018, market was negatively affected. Widened trade deficit to 5-years highest, surging crude oil prices, and upcoming election signaled possibly further rate hike by Monetary Policy Committee. However, IMF’s report stating India to be the world’s fastest growing economy till 2019-20 capped the losses. On the second consecutive day, market ended with a positive wave due to rebounded rupee value from its lowest point and gains in oil and banking stocks. However, profit remains under pressure because of awaited US Federal Reserve’s Chairman’s commentary on interest rate outlook. Afterwards, crashed currency value and declined metal stocks because of slowed Chinese GDP added to the loss but restricted by profit in oil stocks due to fall in crude oil prices. Subdued global market, no-confidence motion against ruling party by opposition party, fall in rupee value, and tariff concerns weighted on the indices. On Friday, the US President Donald Trump accused European Union and China of manipulating their currencies and interest rates which give a signal of upcoming currency war. 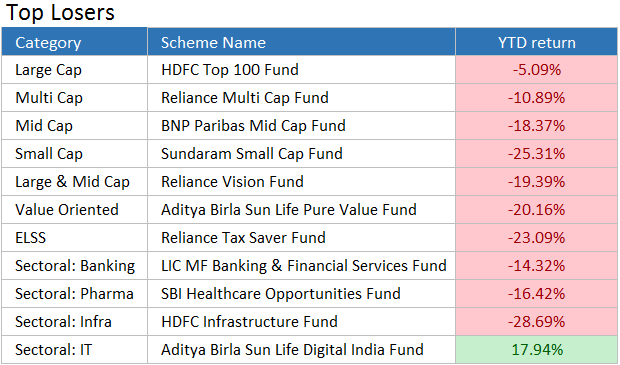 Among 11 sectors, only 4 booked profit this week. S&P BSE energy gained the most with 1.94% weekly profit while S&P BSE oil & gas registered 1.68% profit due to fall in oil prices. On Friday, 5 oil PSUs signed a joint venture agreement to build a gas pipeline connecting Guwahati to other North-Eastern cities. IT sector gained 1.30% because after TCS, Wipro has reported unexpected results for the 1st quarter at 16.3% quarterly growth in net profit. Besides this, company also announced to acquire the US-based Alight Solutions that added profit. Another IT giant, Infosys, is looking for expansion in Berlin by opening a new Digital Studio. Rally in consumer durable stocks booked weekly profit of 1.05%. 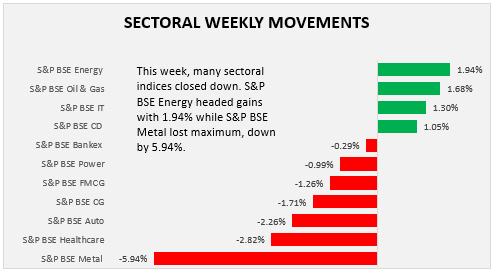 Majority of sectors closed down with S&P BSE Metal as the biggest decliner who lost 5.94% value. It is mainly because of the slowed down Chinese GDP in the second quarter and ongoing trade war. S&P BSE Healthcare has lost 2.82% while Auto sector lost 2.26%. Sell-off in capital goods, fast moving consumer goods, power, and bankex traded market down by 1.71%, 1.26%, 0.99%, and 0.29%, respectively. We hope the market has brought in some good news for each one of you reading this blog. In case you do not find anything favourable this time, do not get disheartened, because the market is bound to make profits in the upcoming period and this short-term volatility does not defines the final outcome. To make the best of this time period, invest in through SIP. You can seek guidance from the experts associated with MySIPonline on getting the best recommendations.